Ex-Birmingham boss Steve Bruce's hopes of a happy return to St Andrew's were wrecked as Hull lost to a deflected first-half strike from Jon Toral. Bruce's Tigers had only needed a point to return to the top of the Championship table. 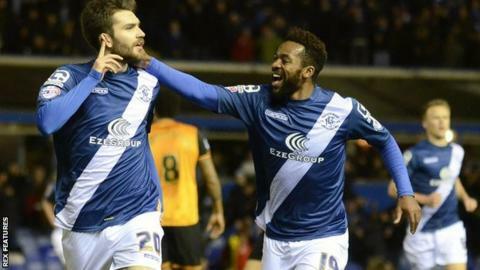 The only goal came on 14 minutes when Toral's low, left-foot drive went in off ex-Blues defender Curtis Davies. In soggy conditions, Hull hit the woodwork twice through Jake Livermore and Michael Dawson. Hull were also denied a penalty when Abel Hernandez's second-half shot was blocked by Paul Robinson's arm. The second half could not quite match the drama of a first 45 minutes, which could have quite easily been 3-3 by the break. Hull had already wasted a great chance when right-back Moses Odubajo blazed over at the far post before Blues scored. Toral tried his luck from outside the box and the ball took a wicked deflection off Davies to nestle neatly into Allan McGregor's right-hand corner. Livermore then cannoned a shot against the post and Dawson's header hit the bar as the visitors searched for an equaliser. McGregor made a stunning reflex save to deny Clayton Donaldson's overhead kick, before Toral headed just wide from David Cotterill's cross. After the break, home goalkeeper Tomasz Kuszczak made a double save late on to deny a fierce left-foot strike from Robert Snodgrass, before also keeping out the follow-up effort from Sam Clucas. Blues have now won six of their last seven home league games and are within a point of the play-off places. Before Thursday's defeat, Hull had lost only once in 2016 - a 1-0 defeat at Burnley in 6 February. Toral's goal was the first Hull had conceded for 477 minutes, during which time they had kept clean sheets at Blackburn, Arsenal (in the FA Cup) and Ipswich. Steve Bruce's side have conceded just 20 goals in 34 league games this season, yet they still do not boast the meanest defence in the division - an honour that belongs to third-placed Middlesbrough (17). Bruce still remains on course to win promotion to the top flight for a second time with Hull, a feat which he achieved with Birmingham in 2002 and 2007. Birmingham City manager Gary Rowett told BBC WM: "We were really good, but we had to be as Hull are a big powerful team who recover their shape very quickly. They're the most complete team in the division. "We had to ride our luck. They hit the post and the bar and Tomasz Kuszczak made a fantastic save for us in the second half, but we created a lot of chances and could have scored more than one ourselves. "I was pleased with the way we showed what we can do after Saturday, when I was so annoyed that I did not talk to one of the players." Hull manager Steve Bruce: "We created enough chances to win two games and we dominated the game really. We did everything but score, then we've lost to a deflected goal. "When that went in, you're already thinking it's going to be one of those nights. These things happen at this time of year. "But there's still a lot of points to be played for and a lot of water to flow under the bridge yet. Birmingham have still got all the top sides to come here so I'm sure they'll do us a favour." Match ends, Birmingham City 1, Hull City 0. Second Half ends, Birmingham City 1, Hull City 0. Attempt missed. Robert Snodgrass (Hull City) header from the right side of the six yard box misses to the right. Attempt blocked. Abel Hernández (Hull City) left footed shot from the centre of the box is blocked. Assisted by Curtis Davies with a headed pass. Attempt missed. David Davis (Birmingham City) left footed shot from the right side of the box misses to the right. Assisted by Jon-Miquel Toral. Foul by Nick Powell (Hull City). Nick Powell (Hull City) wins a free kick in the defensive half. Attempt saved. Jon-Miquel Toral (Birmingham City) left footed shot from the left side of the box is saved in the centre of the goal. Assisted by Jonathan Grounds. Attempt saved. Robert Snodgrass (Hull City) left footed shot from the right side of the box is saved in the centre of the goal. Assisted by Jake Livermore. Corner, Birmingham City. Conceded by Ahmed Elmohamady. Attempt blocked. Sam Clucas (Hull City) left footed shot from very close range is blocked. Attempt blocked. Abel Hernández (Hull City) left footed shot from the centre of the box is blocked. Assisted by Andrew Robertson. Attempt missed. Nick Powell (Hull City) left footed shot from outside the box misses to the right. Assisted by Sam Clucas. Attempt blocked. Jacques Maghoma (Birmingham City) left footed shot from outside the box is blocked. Assisted by Maikel Kieftenbeld. Attempt missed. Ahmed Elmohamady (Hull City) header from the centre of the box is high and wide to the left. Assisted by Robert Snodgrass with a cross following a corner. Corner, Hull City. Conceded by Paul Caddis. Substitution, Hull City. Ahmed Elmohamady replaces Moses Odubajo. Substitution, Birmingham City. David Davis replaces David Cotterill. Attempt saved. Sam Clucas (Hull City) left footed shot from the left side of the box is saved in the centre of the goal. Attempt saved. Robert Snodgrass (Hull City) left footed shot from outside the box is saved in the bottom left corner. Assisted by Abel Hernández. Attempt saved. Jake Livermore (Hull City) right footed shot from the right side of the box is saved in the bottom right corner. Attempt missed. David Cotterill (Birmingham City) right footed shot from outside the box misses to the left. Assisted by Maikel Kieftenbeld. Attempt blocked. Abel Hernández (Hull City) left footed shot from outside the box is blocked. Assisted by Moses Odubajo. Attempt missed. Adama Diomande (Hull City) left footed shot from the centre of the box is high and wide to the left. Assisted by Nick Powell. Stephen Gleeson (Birmingham City) wins a free kick on the right wing. Attempt missed. Nick Powell (Hull City) left footed shot from outside the box is too high. Assisted by Sam Clucas. Attempt blocked. Abel Hernández (Hull City) left footed shot from the centre of the box is blocked. Assisted by Adama Diomande with a headed pass.